So, your nonprofit business has its Google Grant and you’re ready to put that $10,000 to work! Now comes the tricky part…actually using that money to grow your nonprofit. For a standard AdWords account, less keywords often means more results. For a Google Grant, the opposite is often true. Unlike most advertisers, you can’t bid more than $2 per click, which means you typically can’t compete with paying advertisers on the best, highest intent keywords. So, if you want your ads to show, you need to take a different approach. The key is to test out a variety of keywords. Use all the keywords that you can imagine applying to your business. Use those that apply to both the problem you’re addressing and the solution you’re using. The longer your list of keywords, the more options you can test out. It can be hard to predict which keywords will deliver the best results at a $2 cost-per-click, so you may need to test a lot of keywords before you find your winners. The good news is, since it’s a grant, you don’t actually have to pay for all that learning experience, so you can bid on a ton of keywords and quickly figure out which ones work and which ones don’t. One easy way to expand your keyword list is to take advantage of geo-targeting. Location-specific keywords tend to have less competition, which means your ads are a lot more likely to rank high for location-specific searches. Ultimately, adding location-specific keywords takes more time and more work, but it should get you more qualified leads and actually get your ads showing. Another great way to improve your keyword list is to include words that are unique to your nonprofit. What sets you apart? What makes you the nonprofit people will remember? What do you differently than anyone else? Using specific keywords that focus on the unique aspects of your particular nonprofit makes it more likely that anyone who is searching for your specific kind of nonprofit will find it. By now you should have a pretty good idea of what keywords you should be using, but if you need even more options, consider trying some of these keyword tools. With information like keyword search volume or suggested cost per click, these tools give you a much better idea of which keywords to try. They can even help suggest related keywords that you may not have thought of yet. As a result, using keyword research tools is a great way to build a really solid foundation for your ad campaigns. Now that you’ve got that mass of keywords together that you’re wanting to use, it’s time to organize those keywords so that your campaigns and ad groups easy to set up. For example, you might put keywords like “shirt” on a campaign level, and keywords like “men’s shirt” or “women’s shirt” or “children’s shirt” on the AdGroup level. This will save you time in the long run and even help you come up with new keyword ideas. Putting a keyword in brackets makes it so that people need to type the exact set of words that are in the brackets in order to see your ad. So, if your keyword is [help children], your ad would only show when people type in that exact term. In addition to these match types, you can also add negative keywords to better qualify your customers. Essentially, negative keywords tell Google that you do not want your ads to show up for searches with particular keywords. For example, say your business helps children in India, but hasn’t expanded to be able to help in South America yet. You might want to put in negative keywords like “South America” and “Latin America” so that you don’t get people who are only looking to help South Americans. You can use the same word for different kinds of match types and get different results for your company, so try using different variations of match types with some of your favorite keywords. Once you’ve got your keyword list together, you can start making your ads. Here, you’ll use your keyword strategy to guide your ad copy. That way, your target audience will see an ad that is relevant to them when they type in a keyword. Which do you think you’ll click on? 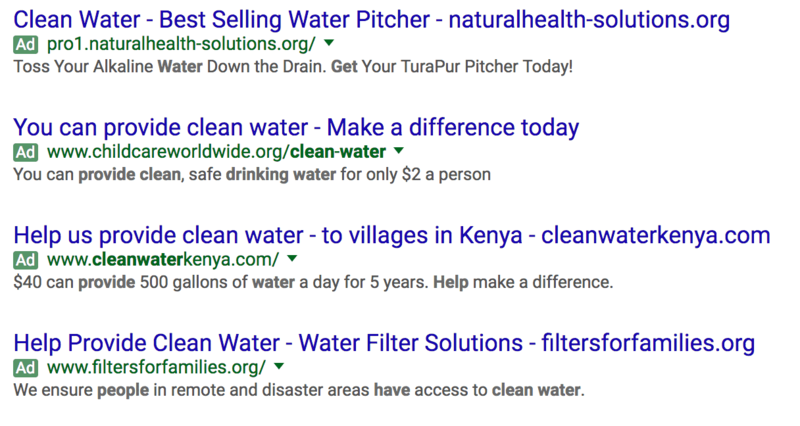 Notice that the ad copy for the three nonprofits involves some variation of “provide clean water”, while the top option is about a clean water pitcher. No one who is looking to “help people get clean water” is looking for a filter for themselves. To avoid this problem, include your keywords and other words that you think people will frequently use to describe your nonprofit in your ad copy. That way, even if your ad isn’t in the top spot, your ad will get clicked by the right audience. Different people will respond in different ways to your ads, so make Ad Groups that target the different groups of people you’re aiming to reach. For example, you might create an ad group that focuses on donor benefits and another that focuses on recipient benefits. While you’re at it, you might make ad groups for each event you make and then have a set of ads that just promote general awareness. This will help you publicize your events, and ensure that people who are making vague searches can still find you. As I mentioned in the keywords section, you’ll want to organize these ads by campaign level (things like “make donations”) and then ad group level (like “donate socks,” “donate shoes,” or “donate rickshaws”). Organizing your campaigns in this way simplifies your job significantly when you’re monitoring your accounts. If ads that apply directly to searched keywords will help people find your company, then landing pages that directly apply to those ads will help them know what to do next. You’ll want to take the keywords you’re using to make your ads and then create landing pages that are specific to the ad people click on. This will simplify their searches and help them find what they’re looking for. For instance, it’s confusing when an ad says “sign up” but it leads to a landing page that says “donate”. Customer confusion leads to loss of conversions. If they’re wanting to sign up for something, help them do it. Keep your pages that ask for people to donate limited to keywords that better fit someone searching for a way to donate to your cause. To illustrate this further, let’s take a look at the landing pages that the ads in the previous example led to. 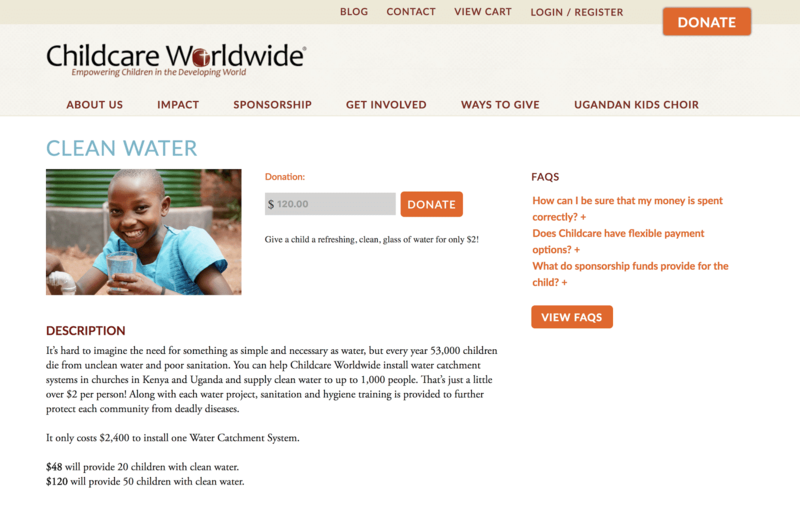 Remember, we searched, “How can I help people get clean water?” and then saw ads for childcareworldwide.org, cleanwaterkenya.com, and filtersforfamilies.com. Not bad eh? There could probably be some better headlines relating to how donation will help get clean water to people, but the information is ultimately all there. This one has better headlines, but it has another step people have to click on to get to actually helping people. Remember, the simpler this is for people, the better. Having another button that makes you click just so you can “Learn how easy it is to help!” seems a little inconvenient. This page seems a little off the message. Even though the ad was about helping with water, the headline leads with “Infant and Mother Health Project.” Now, this isn’t necessarily bad, but for the people who are looking to help people access clean water, the jump logical jump from “clean water” to “health of infants and mothers” may not work very immediately. Also, people who are looking to help entire communities might not get that they’re helping everyone by helping infants and mothers either. 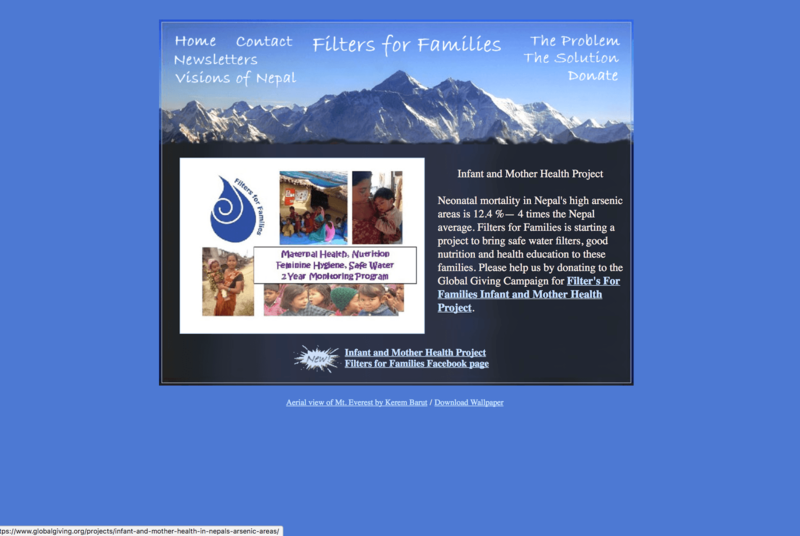 Aside from needing a good design overhaul, this page is good for helping people get involved in helping infants and mothers, but it is not as focused on helping people get clean water. Simply making a landing page that is more specific about how clean water can solve the same problems listed on this page could help people more easily understand how they can help. Simply having unity in your messaging from keyword to call-to-action on a dedicated landing page will make your campaigns run much smoother. Another way to make your ads more effective is to include ad extensions. Ad extensions increase the size of your ads—which increases their visibility on the page—and gives your target audience more ways to interact with your ads. For example, there are call extensions, location extensions or even ad extensions that can send people directly to specific pages on your site (like your “contact us” page). This makes it easy for people to find exactly what they’re looking for on your site. Generally speaking, ad extensions only show up when your ads are at the top of Google, which means your extensions may not show up very often. But, for the times when your ad is on top, setting up ad extensions will set your ad up for success! You’ll also want to be sure to test different ad copy. What works for one person might not work for another and the only way to find out what works best is to test. When you’re testing ads in each ad group, try to make 3 or 4 so that you can see which ones are working better. For example, you might want to test higher-level ad copy that gets really specific to your cause against more general copy to see which one works better for your nonprofit. Also, it’s a good idea to test out different ways of getting people to take the next step. Try using words like donate, help, support, volunteer, and any other synonyms you find that are more motivating. The only way to know whether your campaigns are working (or not) is to track the results of your campaigns. AdWords gives you some limited insights into what’s going on with your ad campaigns, but you’ll definitely need to get some deeper understanding. For that, you’ll need to set up Google Analytics. Google Analytics will let you track the conversions that lead to each of your business’ goals so that you can understand your buyer’s journeys better and adjust your advertising to better meet their needs. You’ll need to know which conversions matter to your business and then get tracking set up for each of them. Maybe you rely a lot on phone calls. Maybe its form submissions or subscriptions to an email list. Whatever it is, you’ll want to track it. Once you’ve set up your campaign, you can just leave it and let it run, right? Your messaging can change, people’s searching habits change, and even Google’s rules change, so it’s important to be checking in on everything at least weekly. You’ll need to keep monitoring everything that you’ve set up so that you can see what’s really bringing in results for your company. When you find out what is not working, you can stop spending on that and redirect that ad spend toward what you find is working better. Really, with bid caps at $2, it’s critical monitor your accounts and keep your eyes open for more opportunities to get seen. Additionally, you’ll want to look for opportunities where you can actually spend less that $2 in your bids so that you can save more money on that. Here at Disruptive, we’ve helped clients cut their cost-per-conversion in half using strategies like this! You’re working to make a difference in the world, and you can do it. You just need to get to the right people to make things happen. Google AdWords can help you do that. Unfortunately, while it’s pretty easy to get a Google Grant, using it effectively will take some time and effort. The key is to make sure you’re testing tons of keywords, keeping unity in your messaging from your keywords to your ads and landing pages and then tracking everything so you can learn from it. Now, if you have any questions, or if you need any help getting your AdWords campaigns set up, feel free to get in touch here, or leave me a note in the comments. What do you think of this approach? What would you change? How have you seen AdWords work for nonprofits?